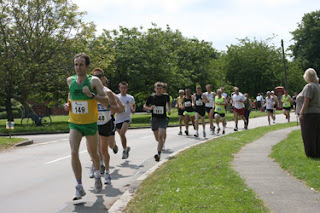 The Henham 10k was held in the picturesque Cambridgeshire village of Henham last Sunday. Henham is a well-kept secret. To get there you have to leave the M11 at Junction 8 and either head through Stansted or go to Stansted Mountfitchet and cross a bridge that is currently under construction (i.e. closed). Fifteen minutes before the race started and I was still trying to find my way out of Stansted airport, having been circling it for about half an hour (I even tried heading to Colchester and doubling back). Only when I took a sign marked for the service station did I find a tiny exit (and no service station), that enabled me to zig-zag between the villages and find the race car park and run to the start, in the car park of Henham and Ugley School and Community Hall. The clouds parted with exquisite timing, and the sun beamed down. My club mate Pietro was there at the start area, looking spry. We shoved our way to the front. And at 11:30, after a lecture from a medic about the dangers of dehydration, off we went. Henham looked fine enough in the sun, though there's not 10k of it: we went along country trail, through some farms, up some off-road hills, and back again. At about 1k in I was only ten or fifteen metres behind Pietro, which didn't seem like a sensible place to be. He was running side by side with the leaders. He's the guy with the red hair in the picture, no. 2, behind the guy with the tight shoulders. Then he evidently got bored and disappeared. By 2k he was out of sight. I'm in the picture too, about a third of the way over from the right, biding my time. Slowly I picked off the runners in front of me, one by one, with increasing frequency. There was a very grim and quite long off-road uphill, before a long downhill. Suddenly we were back in the village and I picked my heels up to leave one forlorn looking veteran behind me and commence a very lonely finish. They cheered charitably enough at the end, and gave me a t-shirt. Pietro won of course, in 35:13. He was going to have to hang around to receive his prize. What a nuisance. I jogged back to the car park, and it was a beautiful Cambridgeshire afternoon, and I'd completed my first race since London. Alas it wasn't a PB, as 38:49 is half a minute behind that target. But you get old and these things happen. It later emerged that I was sixth overall (of 400, many very young or old, mind you), and the third vet. Someone's changed the rules, so that now that I'm 40 vet status comes at 36. Which is a serious moving of the goalposts. However it was a nice day, and I didn't mind too much when I discovered the closed bridge as I approached junction 8 from the other side.